It’s been a while since I’ve posted, but I wanted to share another recent project. In the last week or so there have been a few times where the sprinkler system has gone off while it was raining or just before/after it had rained. 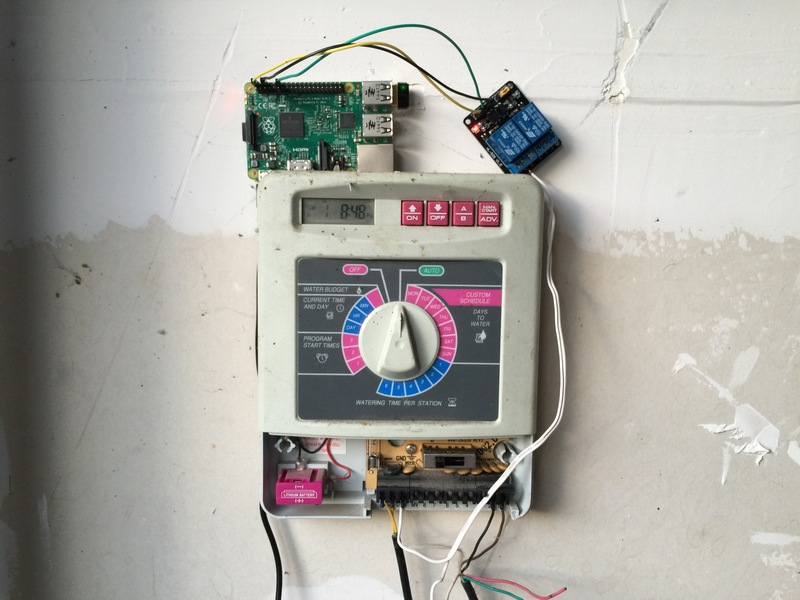 I know there are some sophisticated open source sprinkler system interfaces out there (ie Open Sprinkler Pi), but I wanted to use what I have already and keep it cheap and cheerful. The current scheduler works fine but I want the option to interrupt it for the reasons mentioned above. However, this older model sprinkler (Rainbird ESP-6TM) did not come with a “rain bypass” option. Reading through the documentation however it seems possible to interrupt the program by breaking continuity in the COM line. Typically this is where they would sell you the Rainbird optional rain sensor, and you would wire it here. Instead though, we can insert our internet enabled Raspberry Pi to check some open weather APIs to check conditions in the area and interrupt accordingly!